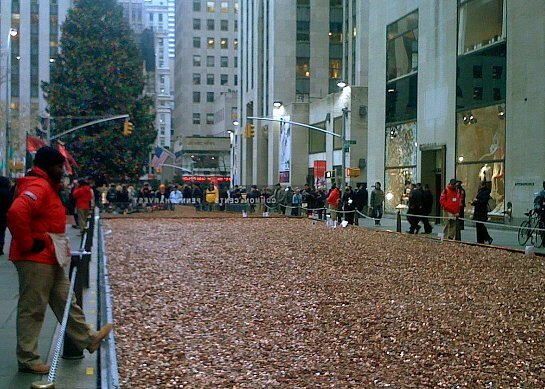 Photo of the Week: I witnessed the Penny Harvest first hand this past week in Rockefeller Plaza in New York City as they look to raise 100 million pennies for charity. The river of pennies was pretty amazing - I have never seen so many pennies in one place. Google is rolling out a centralized profile system that will provide personalized information to each Google product you use. The unimaginatively named Google Profile will share information across all Google products. Tech Digest spouts off 20 things it learned at the Le Web 3.0 conference this past week in Paris. Knols short for "units of knowledge" was announced this week by Google. Some think it will take aim at Wikipedia while others don't. It will include strong community tools and allow users to contribute. Mahalo founder Jason Calacanis hails this new development as “social search” — a type of search that ranks results based on the collective input of humans instead of machines alone. Evite is announcing the launch of QuickVite today. QuickVite is a free, cross-platform mobile/Web application that enables users to plan casual, last minute get-togethers. Mapping out your site before you build it can come in handy and WriteMaps makes it easy to create and share your sitemap ideas. StyleHive, an SF-based social shopping site oriented towards fashion, has acquired StyleDiary, a fashion media site. Terms of the acquisition were not disclosed. Widget platform Clearspring Technology has now joined the game with the Beta launch of a new widget ad network it says will be a one-stop shop for creating widgets, distributing content, selling widget-borne ads and serving those placements. Capazoo differs is its offer to compensate its users for the time spent on the site and the activities they undertake. YouTube began allowing its “most popular and prolific original content creators” to become partners and receive profits from ads displayed alongside their videos, and other revenue sharing models. An artist has captured the various "monsters" of the programming world. You can now see just how much traffic your photos are getting on Flickr by enabling stats. It takes a day to activate but once you do you can see just how popular your photos are. Personally, my somewhatfrank Flickr account has generated about half a million page views for Flickr this year.